Morning! 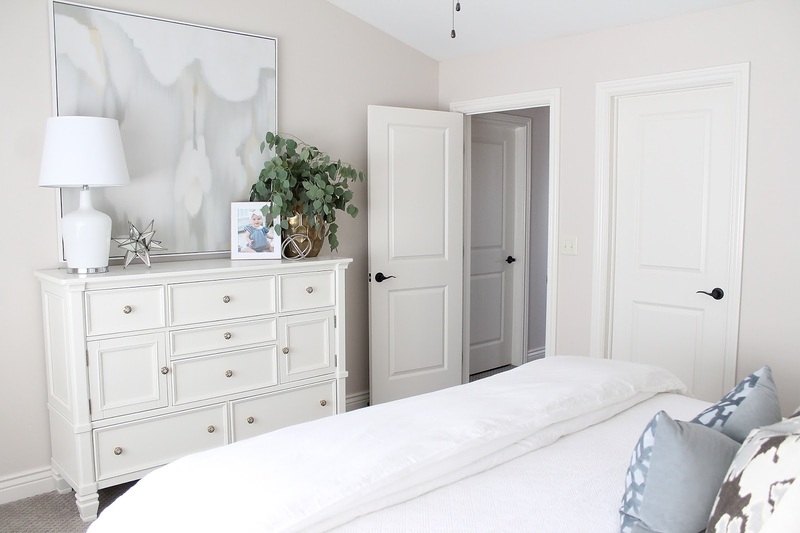 Thank you all so much for your sweet words on our master bedroom reveal. I think you guys love it just as much as we do! As promised, I wanted to break down the budget for everything, since practically every item in the room is new. Before I get into that let me say...it feels a little strange putting how much we paid for everything out on the internet. I understand budgets are a very personal thing, and some people may think this is exorbitant or out of reach. I really understand that. 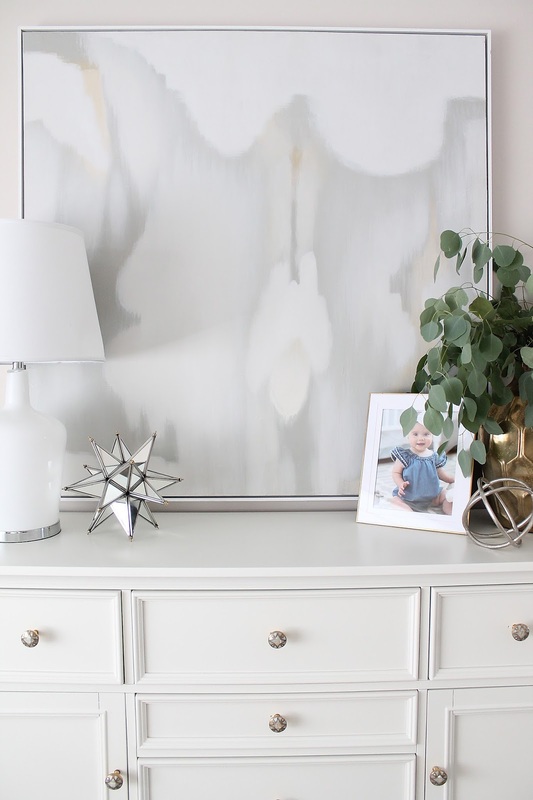 But a few other bloggers I follow have done budget break downs for rooms and I find it really helpful to see what it really does cost to decorate a room if you're a normal person shopping at national retailers. 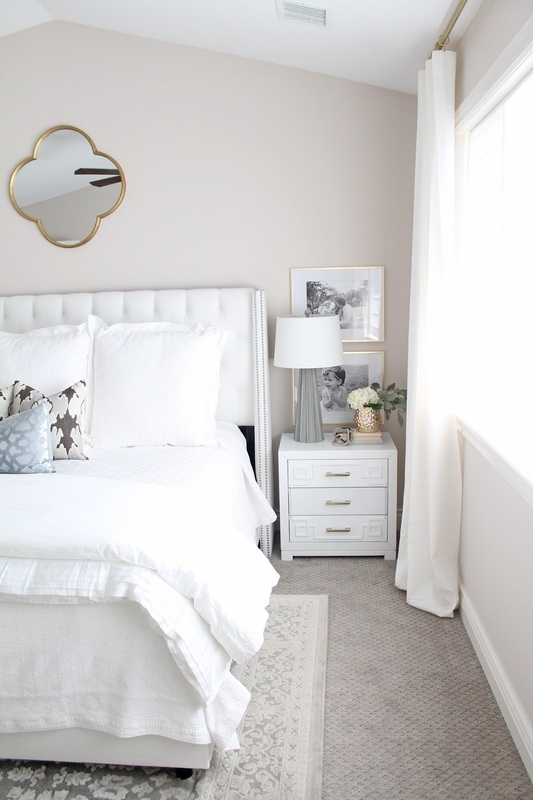 I looked up some designer room quotes and they listed master bedrooms between $12,000 and $48,000 (and that doesn't include the designer fee)...so I'd say we're doing way better than that haha! Now of course if you are a thrifter or DIY-er or furniture painter you could probably do this room for even less with Craigslist scores etc., but we chose not to go that route this time. Hopefully this gives you an idea of what it costs to furnish a room with new pieces from the ground up. Since we upgraded to a king bed, we really did have to buy everything. The only "major" piece we didn't purchase new was the rug (used from our old room) and then just a few accessories. 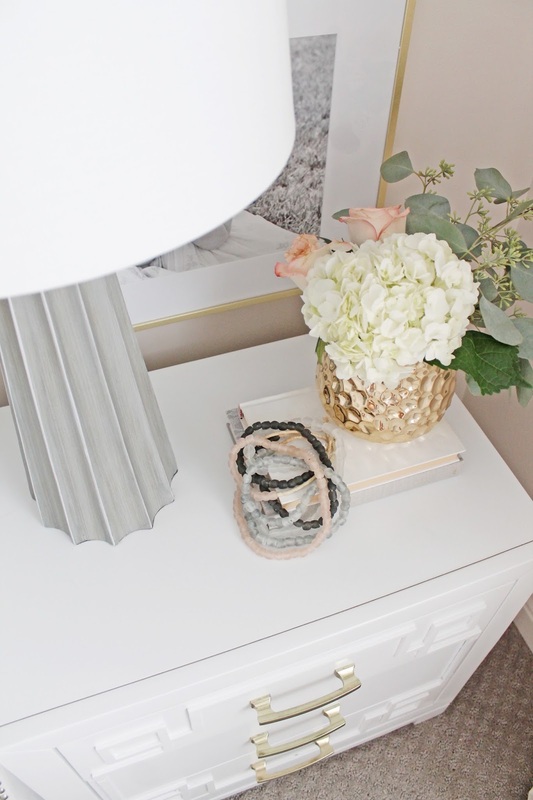 Below is the budget breakdown, or scroll to the bottom of the post for my five tips on furnishing a room on a budget. The bed + mattress + box spring were of course the largest expense, coming in at around $1,550 for all. The dresser was $800 on sale (that includes tax and delivery). I felt like it was a good price for a solid piece of furniture. And it's definitely solid! You should have seen Matt and our friend getting it up our very steep stairs! The nightstands were $220 a piece. Now seeing the quality of them, that seems a bit high to me, but I think it's about the going rate. They aren't low quality but could be a bit better for the price point. The photo project came in at $165, which includes the wall frames and photo printing. We did have a custom roman shade made for this window, as well as adding drapes and hardware. Total for window treatments was $245. So the total for this whole room was just under $4,000. Again, to some that may seem crazy high. Please know I don't take spending thousands of dollars lightly. But I think it just goes to show your home is an investment, and saving up and shopping at discount stores can really help. 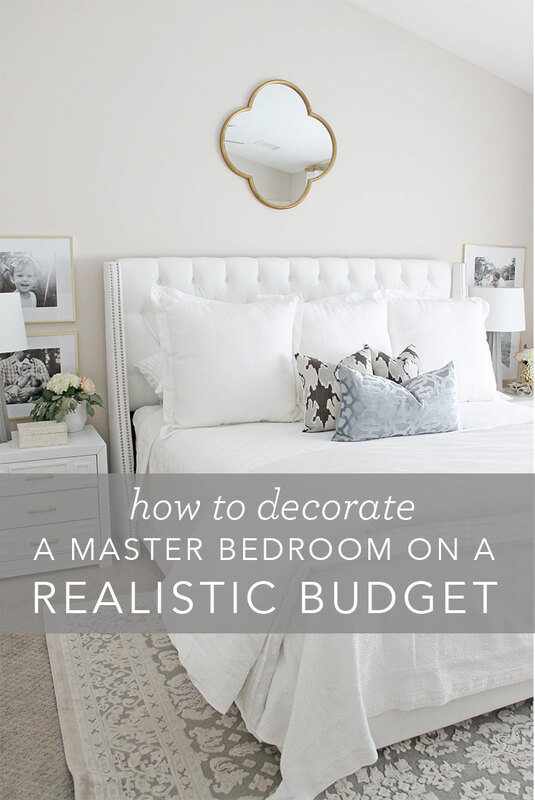 I truly believe you can create a beautiful home on a budget. 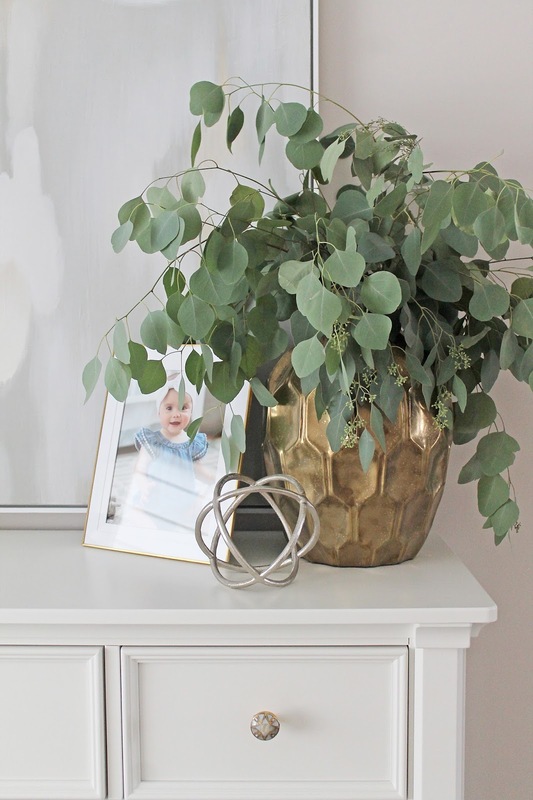 That's my goal in our own home, and I hope this blog can be a resource and inspiration for you as you do the same. 1. Save on your mattress I could go either way on this one. You could spend a lot on a mattress, and I do think it's a worthy splurge. But when we were looking at furnishing a whole room, we knew we couldn't drop a couple thousand on a luxury mattress. 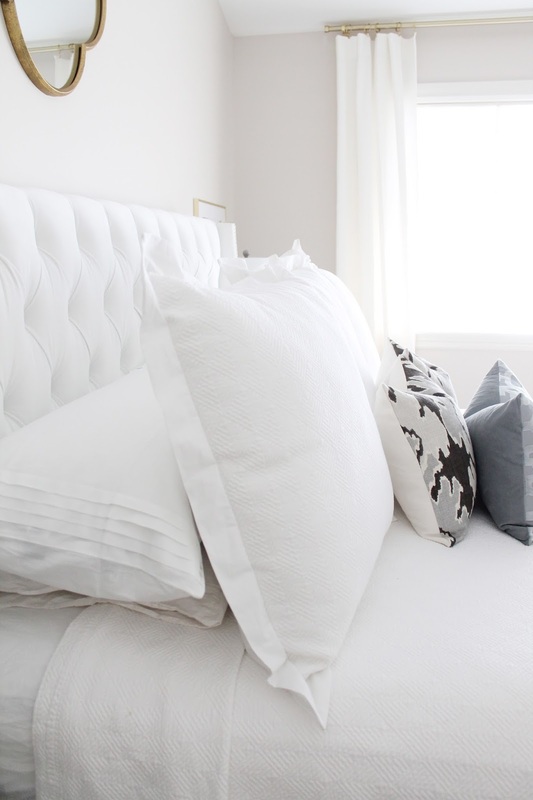 We compromised with a highly rated online mattress and are thrilled! We absolutely love it! 2. Shop Discount Stores Honestly, TJ Maxx, Home Goods, etc. are your best friend. 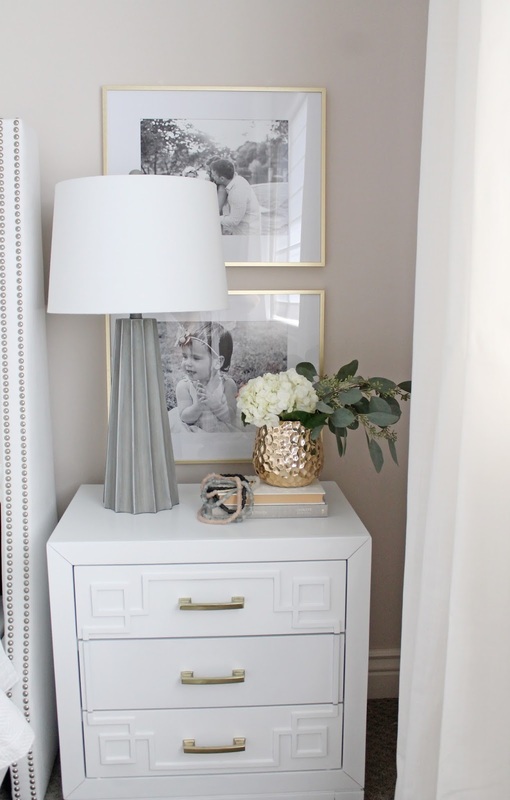 I bought almost identical lamps to the ones in my inspiration photo for just $35 a piece. You just can't beat it! 3. 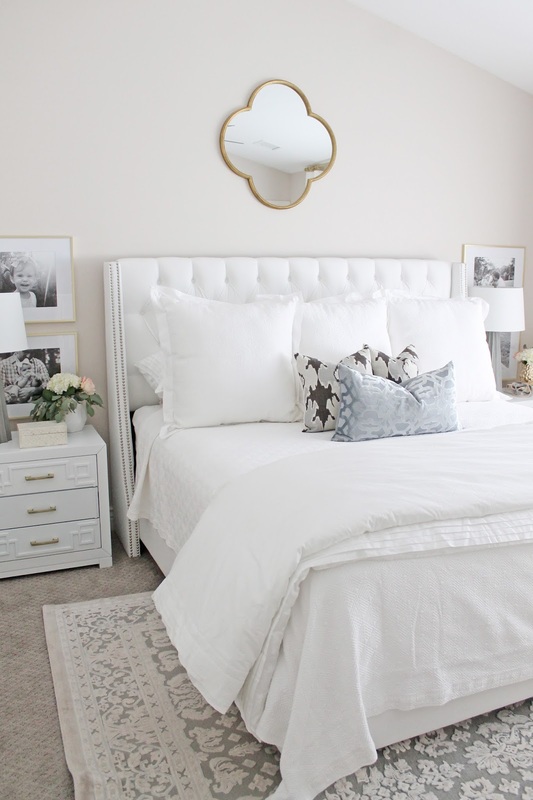 Wait for Furniture Sales I picked out our bed months ago, then stalked it endlessly on multiple sites until I was ready to purchase and knew it was a good deal. Online furniture prices go up and down, so keep an eye on items you're thinking about. Similarly, our dresser was 30% off at a local furniture store. 4. 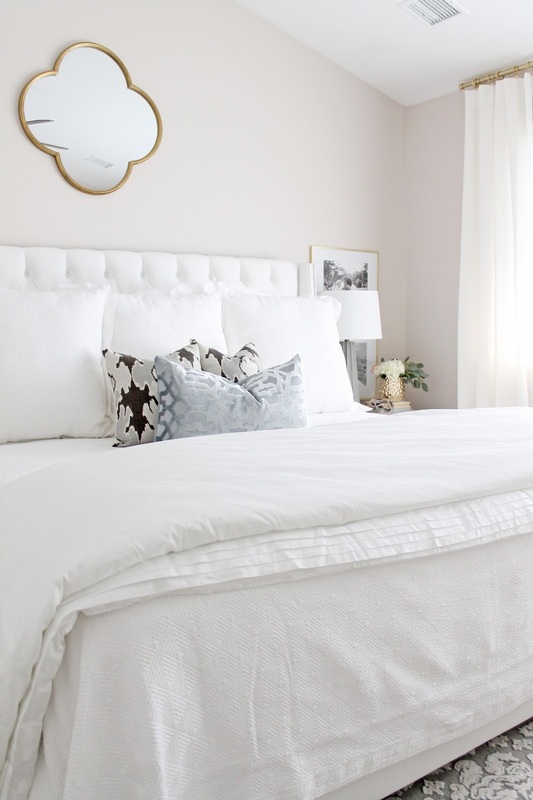 Save on Bedding You can definitely spend some serious cash on high-end bedding, but honestly with all the discount stores out there offering such great options now, there's really no need to. 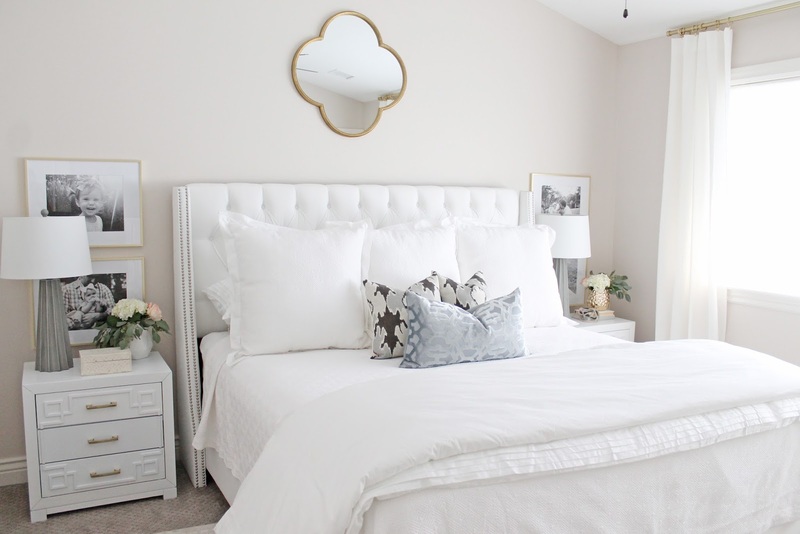 I love a luxurious bed as much as the next person, but I really feel like we still achieved that with Target bedding. 5. 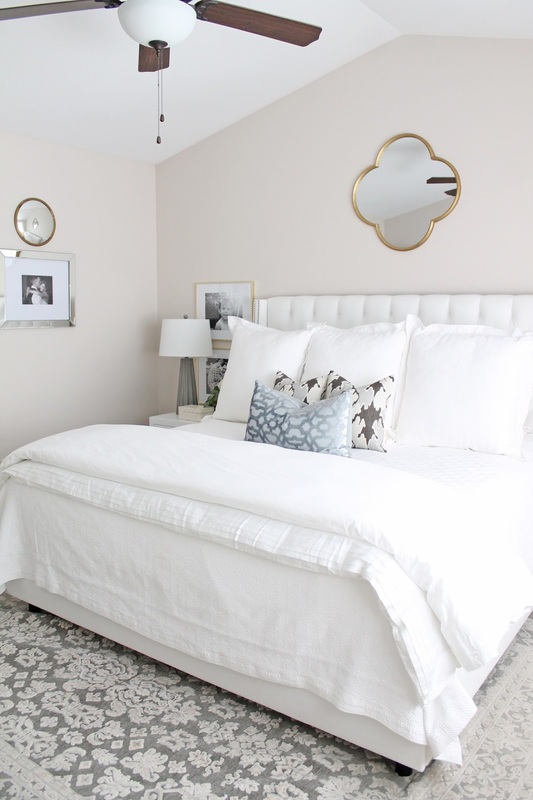 Find the Look You Want for Less I got two really great dupes for this room. 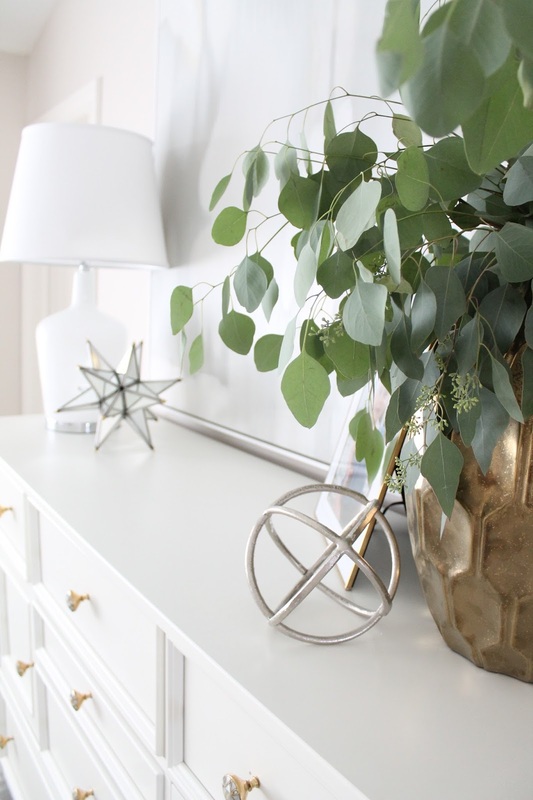 My favorite inexpensive brass curtains are a West Elm lookalike (I blogged about that here) and the dresser drawer pulls were $5 from Hobby Lobby and are the exact same ones that Anthropologie sells for $14. It's worth it to know the look you want then shop around for a better price. 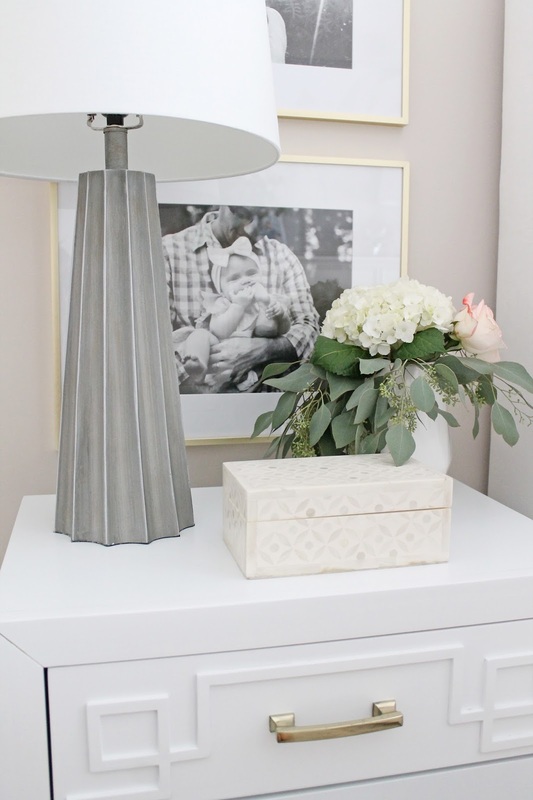 Bonus Tip: Save Up + Sell What You No Longer Need I sold lots of home decor and furniture before our move. 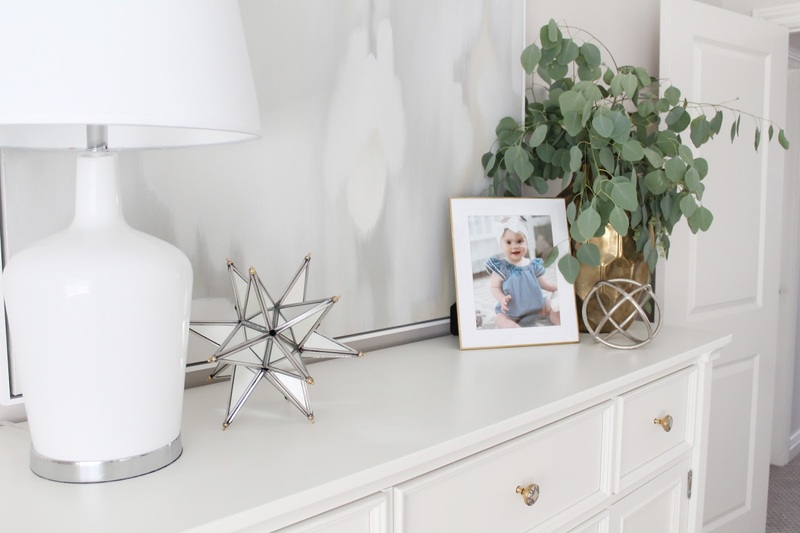 That, combined with saving up for the bedroom we knew we wanted, combined with a side hustle (this little blog!) gave us the funds to furnish the room we always wanted! It's finally here! The first really "complete" room in our house. Granted, we've only lived here a month but I am not terribly patient so it seems like it's taking forever to get everything put together. I know that's not really true, and we made great time on this space. I think it's mostly because I had a really concrete plan and vision for the room, so that helps. 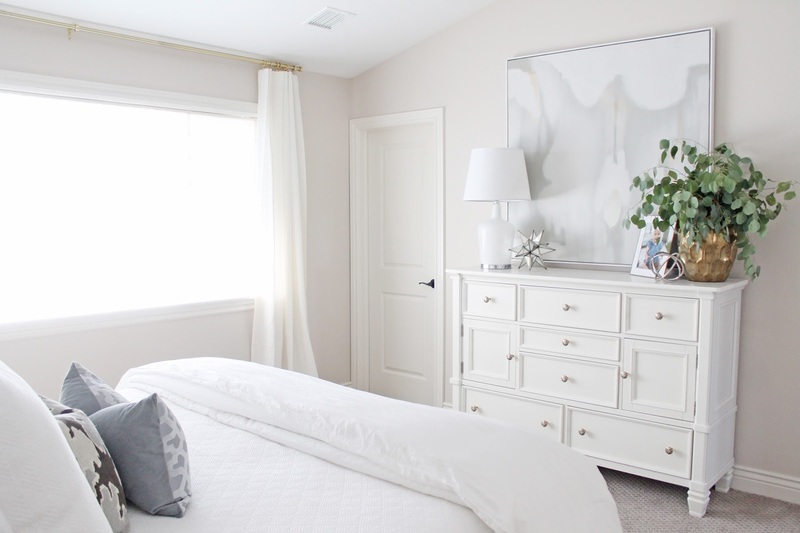 I wanted the space to be white, light, airy and sophisticated - like a luxury hotel. I am so happy with how everything turned out! The star of this show is definitely our bed. We absolutely love it! We had been sleeping on the cheap mattress we purchased when we got married and let's just say it was not up to par and I'm so glad to be done with it! 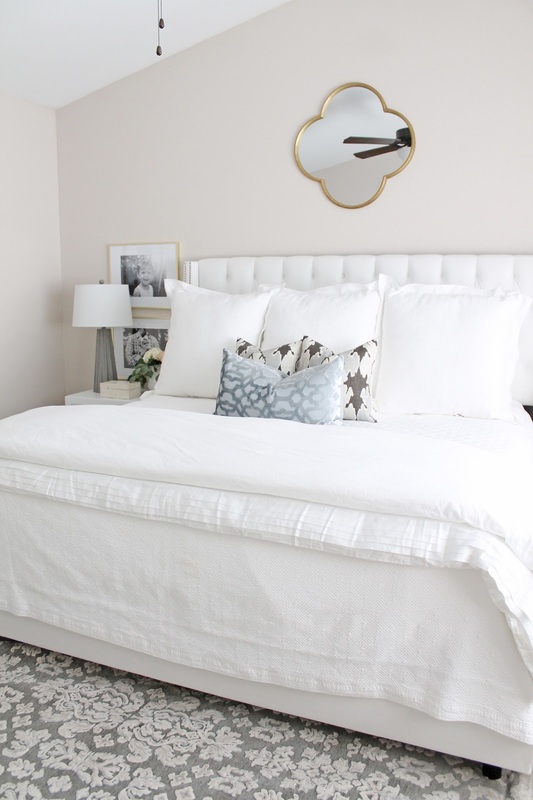 After visiting a few mattress stores and debating about buying online and traditional vs. memory foam (I guess I should write a whole post on choosing a mattress haha) we ended up taking a total leap and buying the Wayfair Sleep 14" Plush mattress and we really do love it. It comes rolled up and then expands when you open it, and we have zero complaints so far. 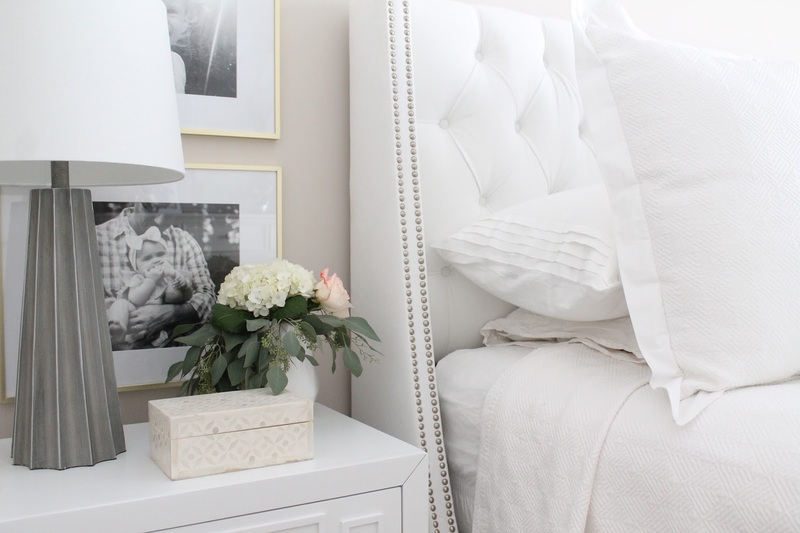 The gorgeous white tufted headboard is from Joss and Main and it's everything I've ever dreamed of. I have always wanted a bed that was tall for some reason - it just feels grand to me. 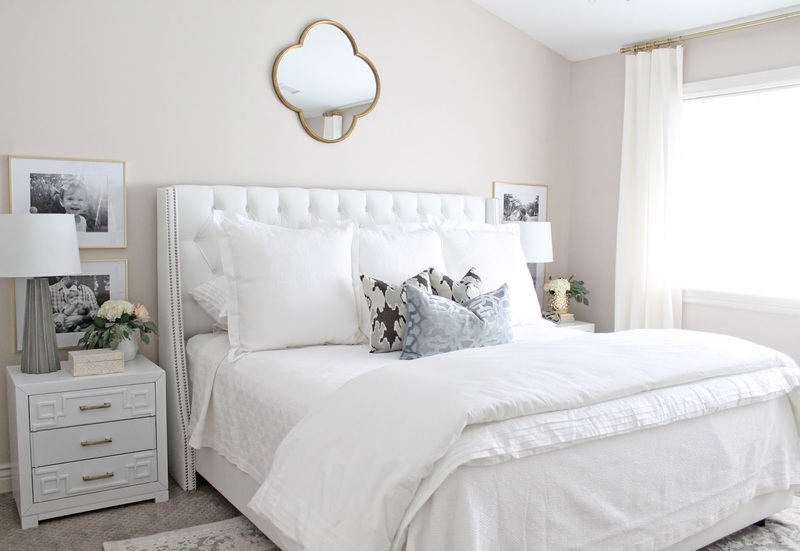 I knew I wanted a pure white tufted headboard, with wingback sides and this one was perfect and is such a good price. 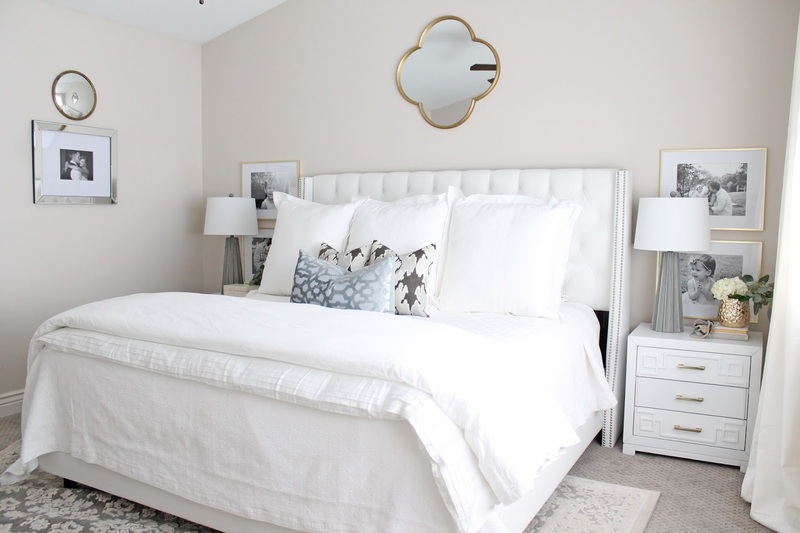 I wanted the room to also have some modern touches, so I paired the traditional headboard with a geometric coverlet and euro pillows and a simple duvet cover (all from Target, but now discontinued Similar Quilt | Similar Europillows | Similar Duvet). 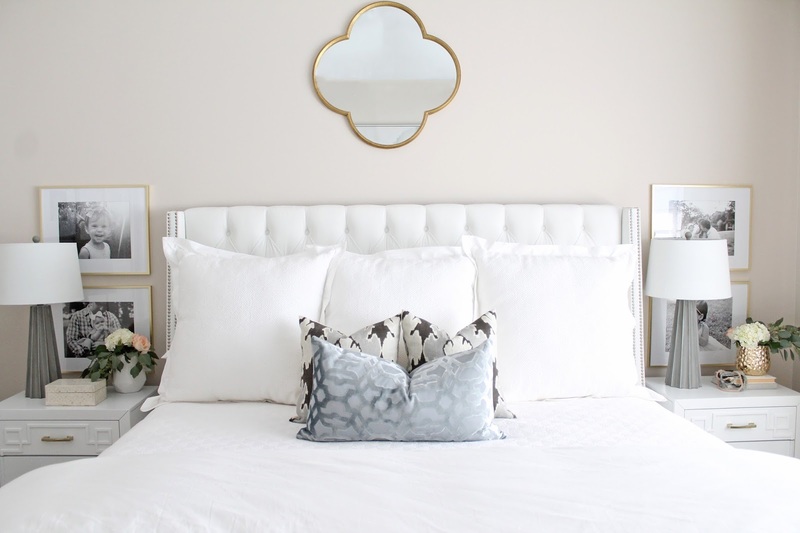 I already had the Kelly Wearstler bengal bazaar pillows and they add the perfect pop of pattern to the all-white palette. 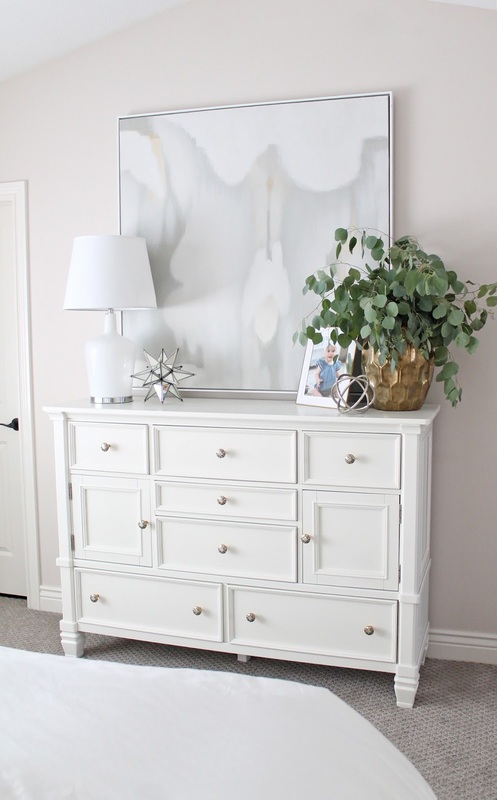 The dresser was a great find at Ashley Furniture Home Store when we were in there looking for something else. I loved that it was nice and tall to add some height to the room. Above it hangs my favorite-ever Home Goods score of this huge and beautiful abstract painting. I adore it. I was even very patient and waited for it to go on clearance before purchasing...so lucky it was still there when I checked back a few weeks later! If you watch my Insta Stories you know I was scouring the internet/stores for a clean-lined but well-sized white lamp to go here. I was even considering paying around $300 for one I liked from Pottery Barn. Then I happened to pop into Tuesday Morning one day and found this one - the perfect thing! I was prepared to pay the usual price of $50 or $60, but it was on 60% off clearance and I ended up getting it for $19! I still can't believe that! The large gold vase was another Home Goods (similar here). 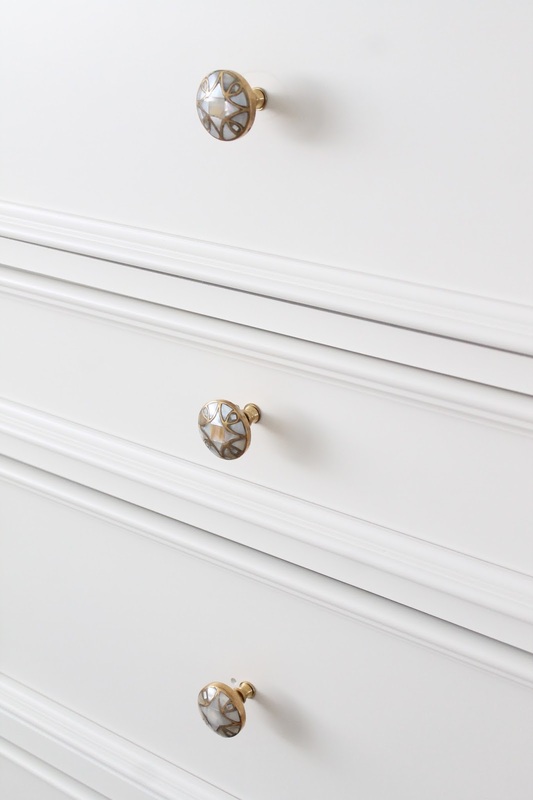 The dresser came with more traditional pulls and I changed them out for these gold and mother of pearl knobs from Hobby Lobby. Our enormous bedroom window faces east and lets in the most beautiful morning light. 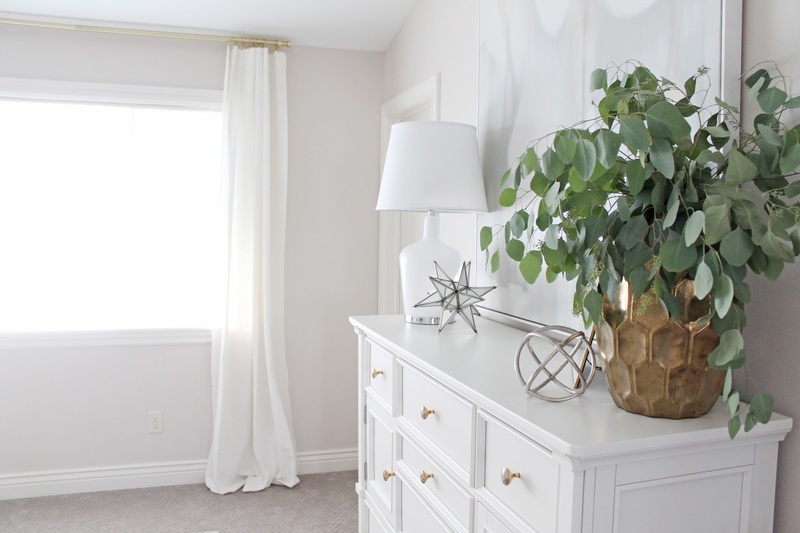 I dressed it with the same favorite brass curtain rods and white curtains as downstairs (I shared about them here). We also needed some sort of blinds or shades for privacy and light blocking, and though you can't really see it in these photos, we went with the roman shades from Select Blinds and are very happy with the quality. 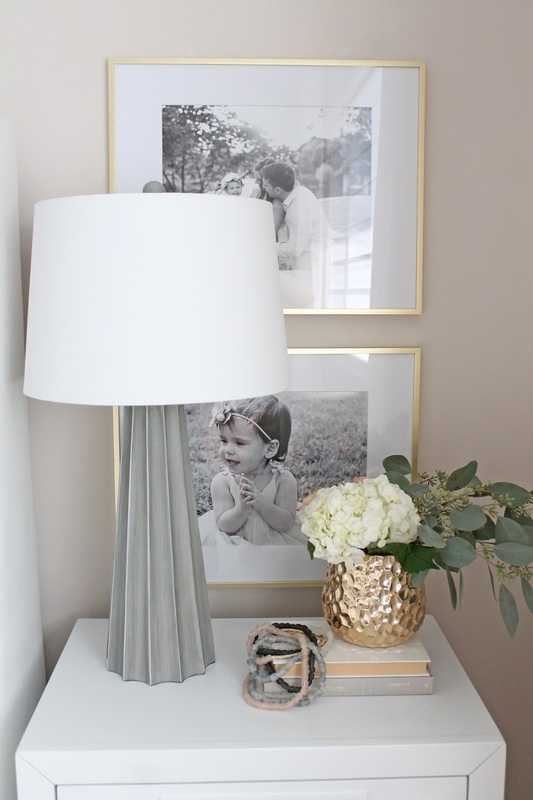 I styled them with my favorite modern brass frames above, filled with black and white family photos. Some designers think it's in bad taste to display family photos, and it can definitely be cheesy or overworked if not executed properly. But these photos make me so happy (and that's the whole point of living in your house!) and I think displaying them in an elegant way really makes all the difference. I adore how it turned out. 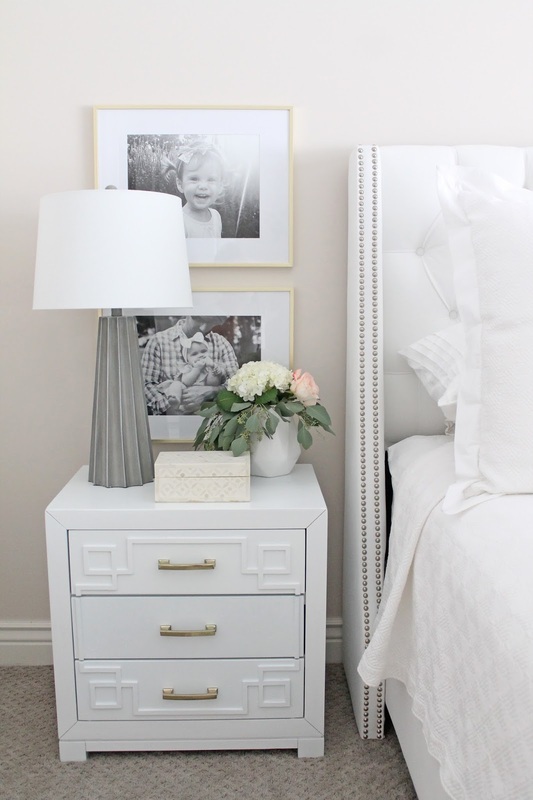 These lamps on the nightstands were another great find. 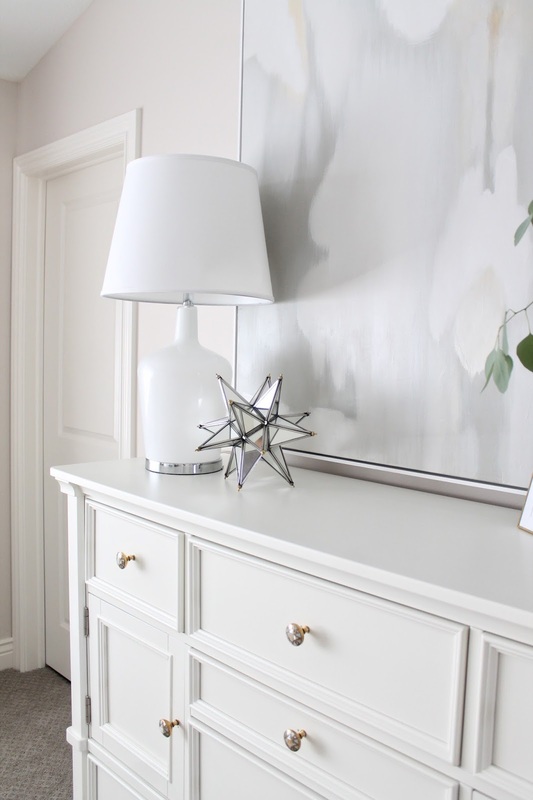 My inspiration for this room was Monika Hibbs' gorgeous master and she has lamps exactly like this, except in white. 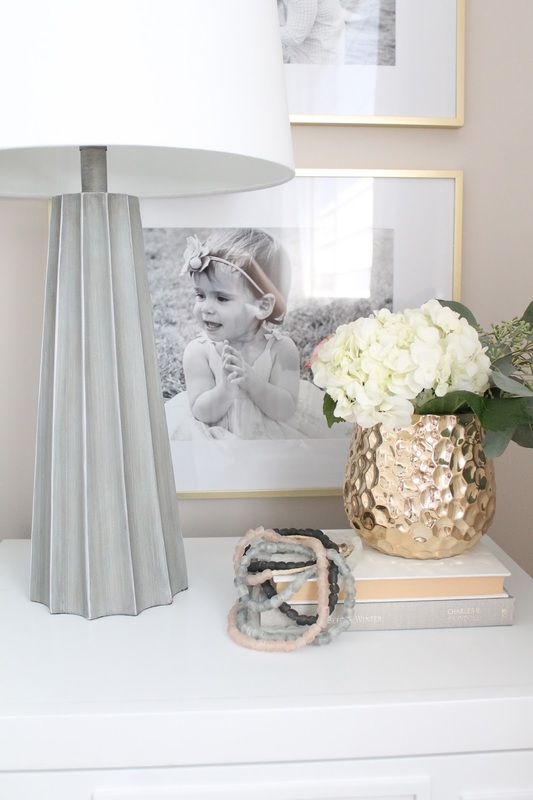 I stumbled across these gray ones at TJ Maxx one day for $35 a piece and was so thrilled I found exactly what I was looking for! Originally I thought I would paint them white but I like the contrast the gray brings once I pulled it all together. 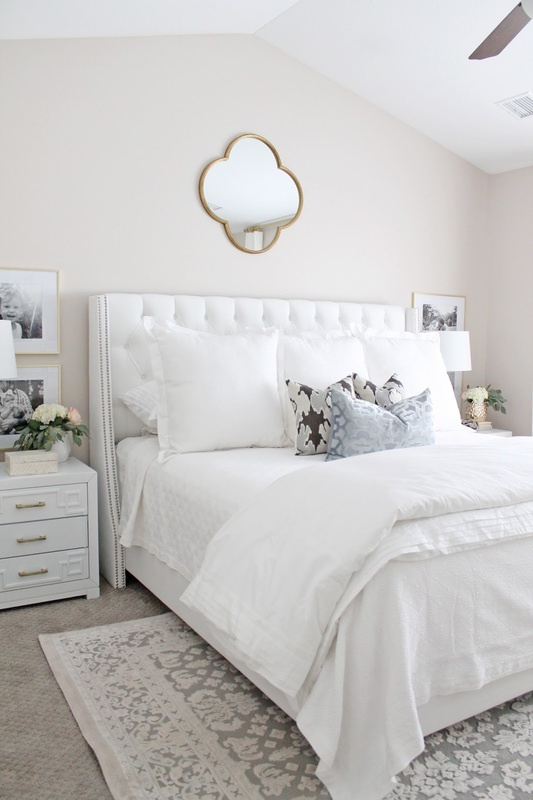 One of my favorite elements is the quatrefoil mirror above the bed. It's from Target but I think it's such a statement piece. One of my favorite things about this house is the vaulted ceilings in the master, and the mirror really helps draw attention to the great height of the ceilings. I am so happy to have this room finished, and it makes me smile every time I walk in. 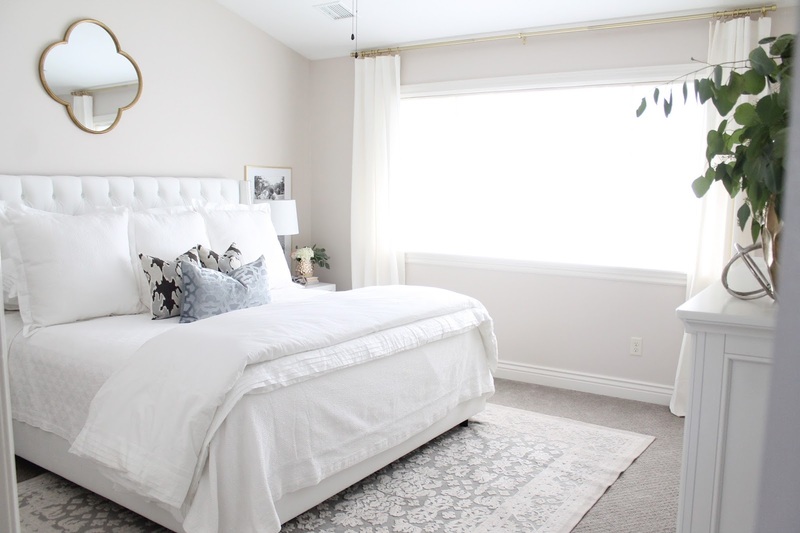 I think often the master bedroom is an afterthought because there are just so many other spaces to worry about, and who really sees it anyway? That's definitely how it was at our last house. 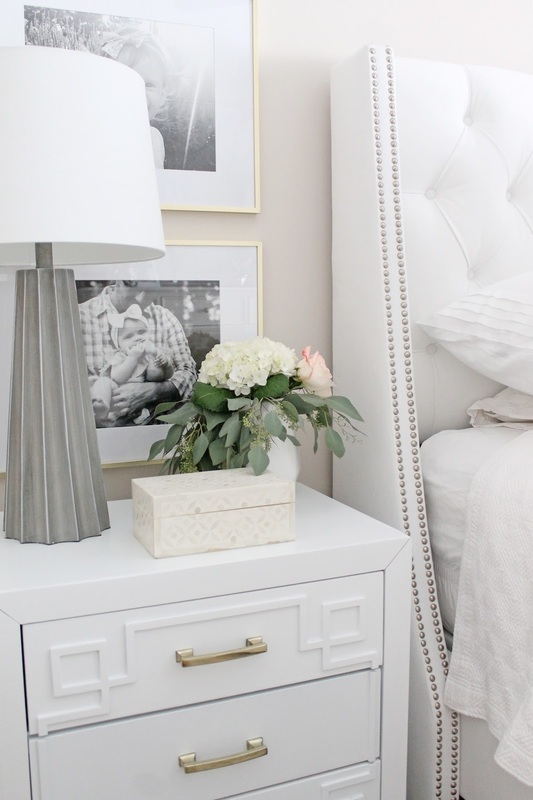 But when I turned 30 this summer I vowed it was time to move on from the dresser set I had had since I was 4 (no joke) and the squeaky newlywed mattress to something that was fresh and sophisticated and felt like a couple of adults lived there. A place we could relax and and unwind at the end of the day. I think we achieved it!